The actor Nakamura Karoku III held the name of Nakamura Baishi I from Spring 1868 to the 12th lunar month of 1869. 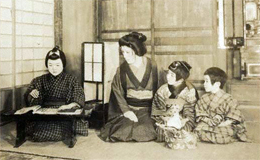 The actor Nakamura Tokizô IV held the name of Nakamura Baishi II from November 1936 to March 1953. The actor Nakamura Tokizô V held the name of Nakamura Baishi III from April 1960 to May 1981. The actor Nakamura Baishi IV is the current holder of the name since June 1994.